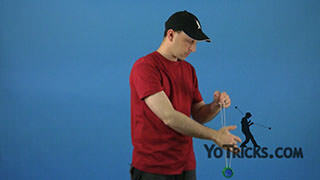 Learn how to yoyo with your first yoyo. If you are just starting to learn how to yoyo, this video will get you started right. 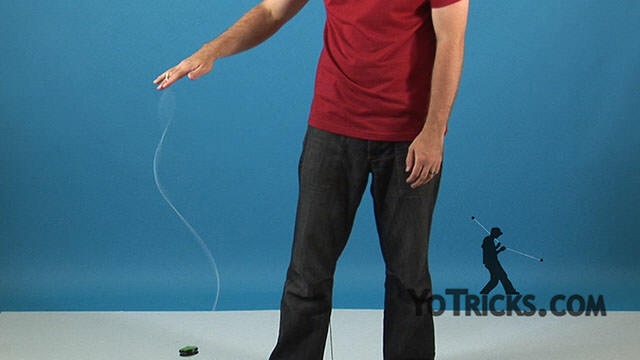 How to Yoyo with your First Yoyo Yoyo TrickSo, you got your first yoyo. Now what? 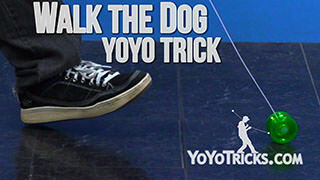 In this video we are going to teach you everything you need to know to learn tricks like this. Well, maybe not that exactly, but we will help you get through all the fundamentals so that you can start learning famous tricks like Rock the Baby, and from there you can move on to some of the most amazing tricks that have ever been done with a yoyo. So the first question is, how do you get this loop on your finger. Well actually it’s not this finger, in yo-yoing we use our middle finger, but the answer should seem obvious. You just put your finger right into the loop. But you don’t want to do that, because if it does not fit tight enough, this could happen. So here’s what you can do. 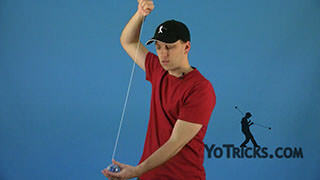 Start with this loop at the top of the string, and then unwrap a couple of inches of string from the yoyo. Then you want to take these strings and fold them over onto themselves so that it creates another loop. Take this loop, and you want to feed it right through this loop at the top of the string, and then you want to stick your middle finger into that loop. Then you can pull it tight. Here’s a tip: you can see on one side of the string there are two strings, and on the other side there is just one. So what you want to do is you always want those double strings to be facing your ring finger, just like that. So now that the yoyo is on your finger you are ready to throw it… but not quite yet. If you hold the yoyo in your hand backwards, this might happen. So start with your palm facing up, and what you want if for the string to be going from your middle finger over the top of the yoyo, like this. That way, when the yoyo is rolled up tight, it will still be able to roll off your hand nicely, so you can get a straight throw. What you don’t want is for the string to be going from your finger to the bottom of the yoyo, because that is backwards, and we know what will happen if we throw it that way. 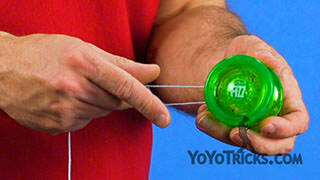 Once you have the yoyo on your finger and you are holding it the right way, you are ready to learn how to throw. What you want to do is make a muscle, then you are going to extend your arm. As you extend it you are going to let the yoyo go. When it gets to the bottom of the string you turn your hand over give it a little tug, and then catch it when it comes back up. 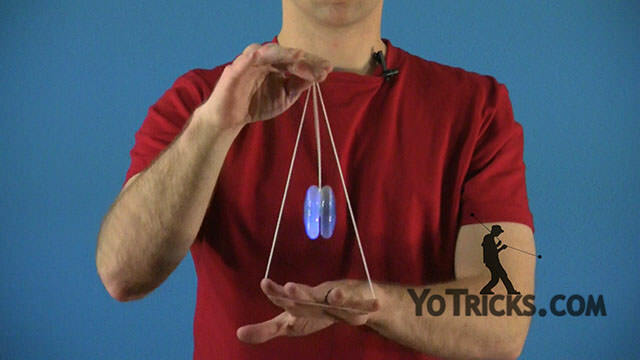 The reason you want to throw like this, instead of just dropping the yoyo, is because you can get a lot more power, which means a lot more spin in your throw when you throw it that way, which means you can do better tricks. Even with your first throw you may find that you are immediately running into problems. The most common problem for new players is that you hit the ground when you throw it. If this is happening to you, one thing that you can do is you can try setting your hand, your opposite hand, as the same height as your belly button, and slap your yoyo hand into it when you throw. 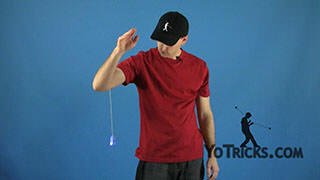 That will keep your yoyo hand from going too low when you throw it. If the yoyo still hits the ground when you throw it that way, that means that your string is too long for your height, and you need to adjust it. We have a video that shows you how to do that, and you definitely want to check that out. A second problem is that the yoyo may not come back up when you pull on it. The most common reason for this is that you are not throwing the yoyo hard enough so that when you tug on the string it is not spinning fast enough for the string to get caught in the gap or to wind all the way back up. The faster a yoyo is spinning, the easier it is going to be for the yoyo to wind back up. If you want to add some more power to your throw, what you can do is lift your elbow and then drop it as you throw, and that will help the yoyo to spin as fast as possible. The second reason why this might be happening is you may be tugging the yoyo up wrong. What you don’t want to do is raise your whole arm to try to get the yoyo to come back up because that motion isn’t fast enough. 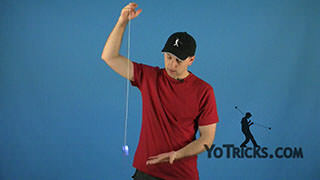 What you do want to do is give a little flick with your wrist to try to pop the yoyo up three or four inches, and that gives the string enough slack so that the spin of the yoyo can grab the string and wind the yoyo back up. If you are sure that your yoyo is spinning fast enough, and that you are pulling it up correctly, but it is still not coming back you may have gotten what is called an unresponsive yoyo, and this is especially likely if your yoyo is made out of metal. Unresponsive yoyos are designed to never come back no matter how fast they are spinning or how you pull them up. 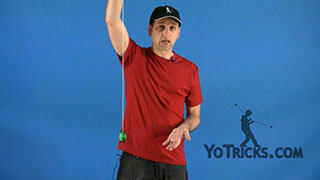 To get an unresponsive yoyo to come back you need to learn a trick called the Bind. We have videos that teach you how to bind, so you are going to want to check those out. At some point when you are learning how to yoyo, you are going to need to wind the string back up. There are fast ways to do this, and we teach you how to do that in other videos, but for now it is not a bad idea to just learn to wind it in the conventional way. With a lot of yoyos, if you pull the string too tight as you try to wind it the string will just spin around the axle, and the yoyo won’t wind up. In most cases you can get the string to wind if you just start off really lightly, then eventually you will see it wrap around the axle and you can wind it all the way up. If that doesn’t work, there is another technique you can try. What you are going to do is put your first finger over the gap of the yoyo and then take the string and wind over that finger one time. Then, lift it up and wind under your finger three or four times. You can wind pretty tight because you are holding the string with this first finger. You should be able to remove this finger and wind the yoyo up the rest of the way. If you can’t wind the yoyo even after that, you may need to wind under your finger several more times, until you get it right. When you are yo-yoing long enough, one of the things you will encounter is what yoyoers call string tension and what some new players call spaghetti string. Spaghetti string is frustrating because it can cause all kinds of problems, and it can make things really frustrating. There are tricks that are designed to help you quickly remove string tension, like UFO, and we have videos on those, and you can check those out. If you are a new player, there is a really easy way to deal with string tension. What you do is you take the string off your finger, and you let it hand. You can see that it naturally untwists itself and that removes most or all of the tension. 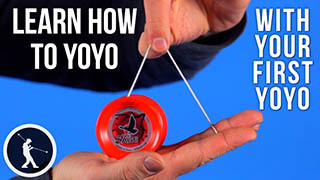 Before you put the yoyo back onto your finger you want to wind the yoyo back up, because if you put it back onto your finger first that will actually add tension back into the string. String tension naturally builds up as you play with a yoyo. One thing you can do to counteract the string tension is when you do wind the yoyo back up, if you wind it in the reverse direction, so you are actually winding towards yourself, that will counteract that string tension so it will be less of a problem. The biggest problem that string tension can cause, is that with some yoyos it can actually keep your yoyo from sleeping. That is not the only reason why a yoyo might not sleep, so we made a video that covers all the different reasons this might happen, so if your yoyo is not sleeping, you may want to check that video out. Another common problem that new players experience is that when their yoyo sleeps it is tilted or leaning or it’s crooked. In no case is this the fault of the yoyo, even if a yoyo is wildly imbalanced it would not cause this to happen. In every case it has to do with how you throw the yoyo. If a yoyo is not spinning fast enough it will have a greater tendency to lean, but in most cases it just means that your throw is crooked. If you want to have a straight throw, the first thing you should do is line up your shoulder, your elbow, and your wrist, and that will help keep your throw straight. A second thing is that a lot of new players have a tendency to turn their hands over too quickly. If you turn your hand over while you throw the yoyo that will cause it to lean and possibly even spin out. If you are having a hard time keeping yourself from turning your hand over you can use the technique we showed earlier where you slap your other hand like that, and that will make sure that you don’t turn your hand over while you throw. Another common problem that comes up is that as you throw the yoyo your finger will start to hurt because the string is constantly gripping it. What happens over time is your finger will naturally build up a callus which means that your skin will get thicker there to protect your finger, and that will stop it from hurting. If you just want to keep practicing, and you don’t want to stop regardless of the pain, one thing you can do is get yoyo finger wrap and that will help solve that problem as well. One more tip to help you avoid some pain: as your throw improves you will find that the yoyo comes back faster and faster, and eventually its slamming into your hand can really hurt. To keep that from happening, as the yoyo comes back to your hand just move your hand away from the yoyo a little bit, and that will cushion the blow. Remember, this is just the beginning. 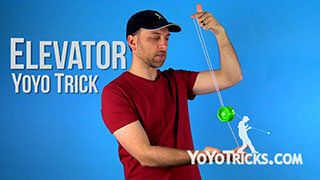 We have all kinds of tricks on YoYoTricks.com that you can learn. If you want to learn on the go you can also download our app for Apple or Android devices. Once you have mastered the techniques in this video, really, the sky’s the limit. Why Won’t My Yoyo Sleep At All?